Horticultural lighting for the serious hobbyist; the Gavita Pro 1000 is the first 240 Volt electronic ballast that powers the professional Philips Green Power 1000W 400V double ended EL (electronic) lamp. 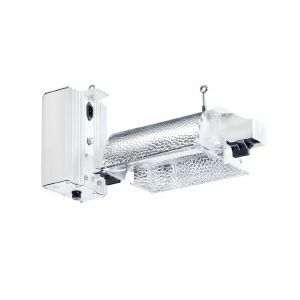 Featuring the highest PAR light output of any 1000 watt horticultural lamp, Phillips double ended (DE) lamps remove the need for a frame support wire inside the lamp, which eliminates any shadows in the beam. The Gavita Pro 1000 is supplied as a complete fixture with the HortiStar 1000 DE reflector, which is specifically designed for this lamp. Replacement 1000 DE Miro aluminium reflectors are available separately.